Cover Thumbnailer is a small Python script which displays music/video album covers in Nautilus in place of ordinary icons of folders, preview of pictures in a folder and more. 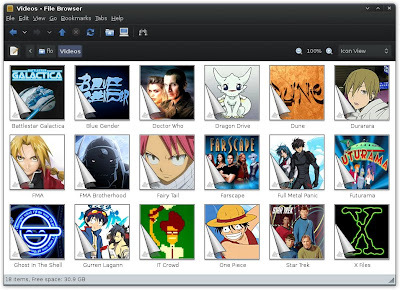 It is similar to what you see in Microsoft Windows 7 where the folder shows a preview of the pictures contained in it. This is for Ubuntu users running v 9.10 Karmic, v 10.04 Lucid and v 10.10 Maverick . Once Cover Thumbnailer has been installed, you will have to restart Nautilus by running the following command. Now the specified folders containing music files will display the respective album cover / mosaic of covers. If you are using another Linux distribution, you can download the source code from the Cover Thumbnailer website, compile it, and install it on your machine. 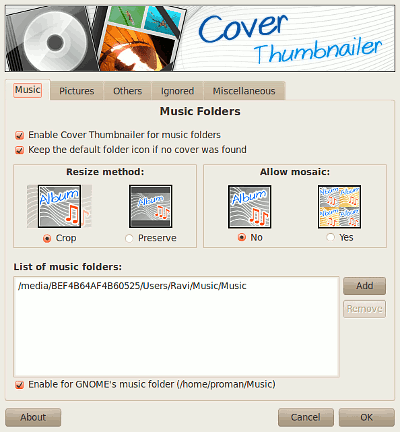 Cover Thumbnailer program will store a cache of cropped images of albums in a hidden folder named .thumbnails/ in your home directory. The .thumbnails/ directory is a cache directory created by GNOME when you browse through your folders in Nautilus. It contains thumbnail pictures of images you have previously viewed. And when you visit a particular music folder, the thumbnail of the respective album is shown on top of the folder. You can access the Cover Thumbnailer preferences via GNOME Menu > System > Preferences > Cover Thumbnailer. Here you can specify more folders that can avail of Cover Thumbnailer's services and set many other options such as clearing the thumbnail cache and more. Here is how the folders looks after you install cover thumbnailer program in Ubuntu.